Ladies and gentlemen, secure your floaties and water wings. 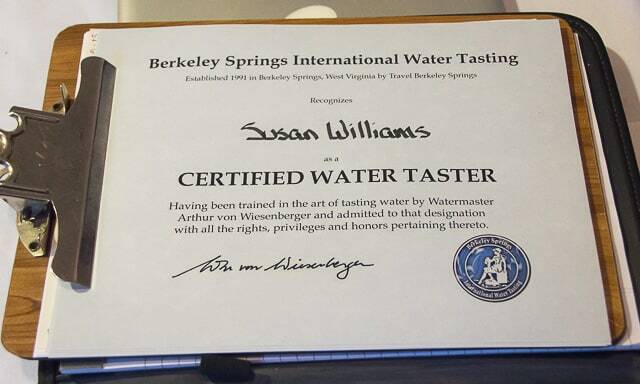 It’s about to get all wet up in here, as we virtually visit Berkeley Springs and the International Water Tasting. 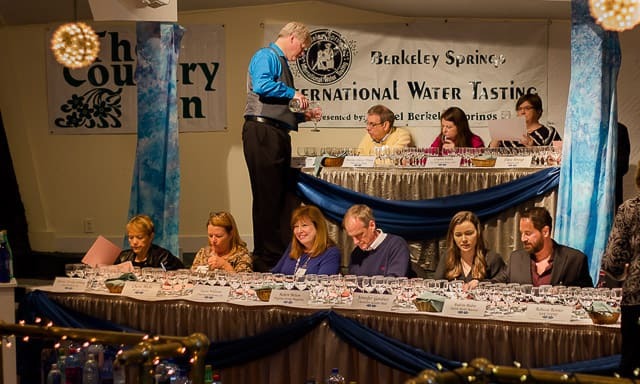 I’ve got four great reasons for you to visit Berkeley Springs – and one of them happens to be why I was there in February: I was a judge at the 28th Annual International Water Tasting. More about that later. 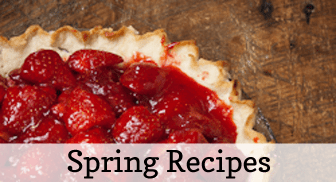 First, let me give you three other reasons why YOU should visit Berkeley Springs, WV. 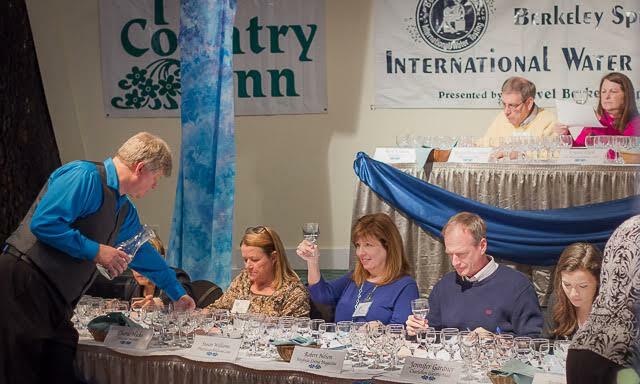 The 28th Annual International Water Tasting was held at the Country Inn, in Berkeley Springs, West Virginia. The Country Inn also happens to be where Tom Netherton, that slightly sweaty version of a singing Ken Doll, of Lawrence Welk Fame, used to hold court, singing for his adoring fans. I know this, because I used to watch Lawrence Welk with my grandparents, who were living in Berkeley Springs at the time. You simply cannot make this stuff up. One more thing first: a disclaimer. As a judge, I did receive free lodging, and a couple of free meals on the day of the event, in exchange for sharing whatever I wanted to about my weekend. But, as always, all thoughts and opinions herein are STRICTLY my own. That’s the way I like it, and I hope you do, too! Berkeley Springs, originally known as the town of Bath until the 1800’s, is located in the eastern panhandle of West (by God) Virginia. Its mineral springs, which remain at a constant temperature of 74º, year round, were its claim to fame. It was first famous among the Native Americans who lived in that area, for its alleged healing powers. Its fame grew among the white settlers who showed up in the 1700’s, “Ye fam’d springs” were mentioned by George Washington in a letter he wrote as a young man, when he was surveying the land for Lord Fairfax. Fairfax built his summer home there, and soon, all the elite of Virginia society were traveling to Berkeley Springs to take the waters. (They also did some pretty serious partying and gambling.) Washington himself, as well as his family and friends, also purchased land in Berkeley Springs, Bath, as it was known then, became a destination city for weekend getaways. 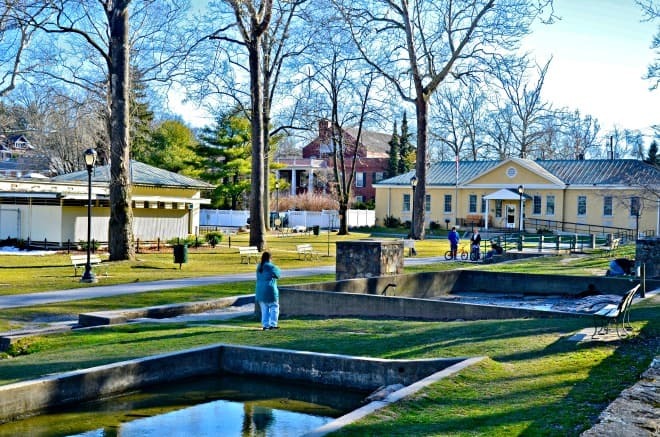 You can, and should, still enjoy those same mineral spring waters in Berkeley Springs. A really affordable way to do that is to visit the State Park, the area where the Springs bubble up, located right in the center of town, and make a reservation to take a Roman Bath at one of the bathhouses. If you’re looking for something a little more luxurious, there are several privately owned spas around town where you can book any kind of spa treatment your little heart desires. I think Berkeley Springs would be a great location for a “Girlfriend Getaway” kind of trip. Berkeley Springs is a small town nestled at the north end of the Shenandoah Valley. It’s somewhat off the beaten path, but easy to find, and worth seeking out, especially due to its proximity to so many densely populated areas. Its location in the eastern panhandle of West Virginia, puts Berkeley Springs smack dab in between Virginia, Maryland, and Pennsylvania, but quite close to Baltimore, and Washington, DC as well. So, if you’re hungry to leave the throngs jamming the Beltway behind you, Berkeley Springs is a marvelous getaway destination. On a personal note, as we were driving into West Virginia to attend the International Water Tasting, I noticed that their state slogan, written on the interstate sign, appears to have been returned (thank God) to “Wild, Wonderful West Virginia”. I’d like to propose a new slogan for them. So, back to the MAIN topic, which is Berkeley Springs, and why you should visit it. Berkeley Springs, especially the Berkeley Springs of my youth, is a lot like Mayberry. My parents would take us every summer to our grandparents house there in Berkeley Springs, and I have so many happy memories of helping my grandmother harvest green beans from the garden in her back yard, that lay just across the little bridge that crossed the creek. MomMom and I would sit on the front porch and “string” the beans, and watch the occasional truck roll down Rt. 522. I remember spending hours playing in that creek that ran behind their house, squatting down to peek under rocks in hopes of finding a crawdad. Crawdads both frightened, and fascinated me. Crawdads and minnows were everywhere, it seemed. And we’d take our dimes and our quarters, and walk down to the Tastee-Freeze on the corner, to get soft serve ice cream cones, and to occasionally slip a quarter in the juke box, to listen to the Carpenters’ sing, “Close to You”. It really was Small Town, USA. But if the Berkeley Springs of my youth WAS like Mayberry, these days, Aint Bee has retired her girdle, and traded it in for a tie-dyed T-shirt. Furthermore, now she smells of incense and patchouli, and wears crystals around her neck. She’s also a member of the local arts council. The shops lining the main street are different these days. The Tastee-Freeze is gone. But you can find some great crystals! My husband and I very much enjoyed our visit to the art gallery and retail shop at the “Ice House” which is the center for the arts in Morgan County. They display the work of local artists who have been juried in, but also host visiting artists. We loved watching a visiting artist at work, as he made wooden bowls with an adze out of one huge piece of wood. I believe I could have sat and visited with him for another hour, at least. And he had chairs set up for visitors to do just that. In Berkeley Springs, if you feel like sittin’ a spell, well, that’s just fine. In the town square of today, you’ll find cool gift shops, antique shops, and quaint little restaurants and brew pubs, all just waiting to be discovered. 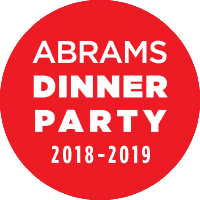 If you’ve ever visited Asheville, NC, which is one of my favorite towns in the whole world, due to its thriving food scene and arts community, Berkeley Springs has very much taken on the “cool arts community” vibe. 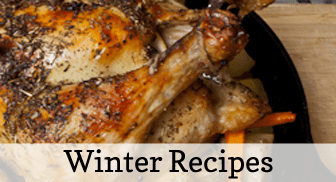 I’m pretty picky when it comes to accommodations and restaurants, but I do have two great recommendations for you that we enjoyed. Make it a point to have at least one meal at Lot 12 Public House. We had an excellent meal there, even though it was a little pricey. But for the “fancy” meal of your visit, the chef at Lot 12 is doing all kinds of things right. So, plan to eat there. 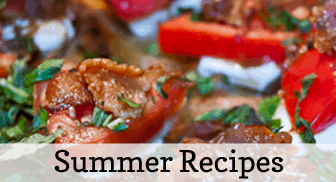 And be sure to make reservations. They’re not open every night. 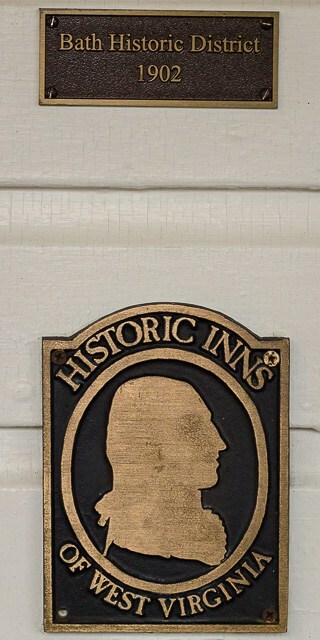 The plaque on the wall by the door of the Highlawn Inn. I highly recommend the Highlawn Inn, if you think you’d enjoy an in-town overnight experience. 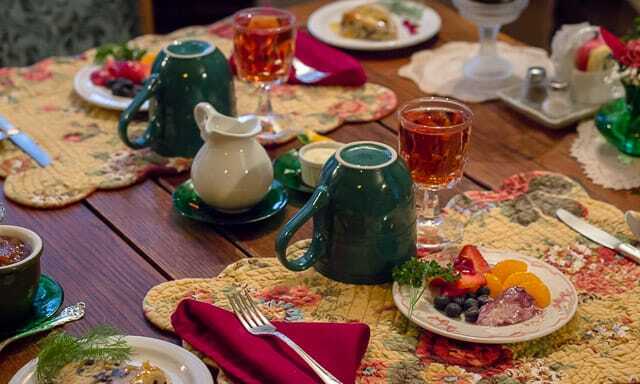 This lovely, cozy Bed and Breakfast is an Historic Inn, and your host will be Sandy, who is absolutely delightful. 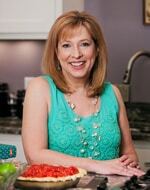 She is not only the perfect hostess, but her brain is a repository of a wealth of knowledge regarding Berkeley Springs. 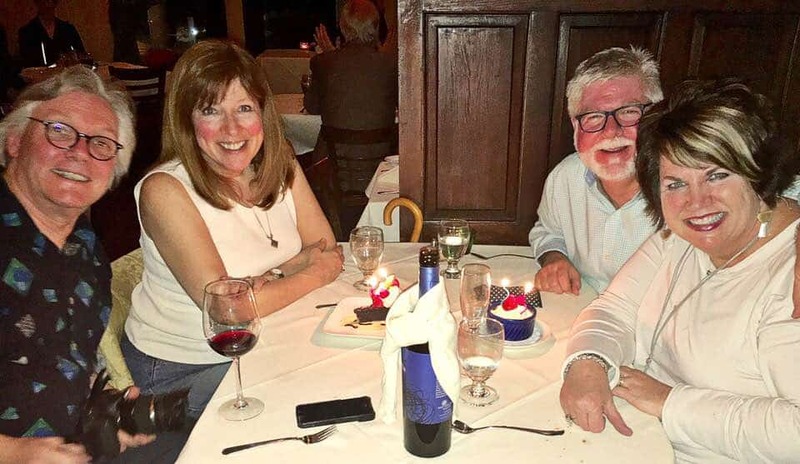 She pretty much knows everything about the town – not only historically speaking, but she’s also completely up-to-date on what events are currently happening in town, and worth seeking out. Our breakfast was waiting for us so prettily at the Highlawn Inn, before we began our busy day of judging. 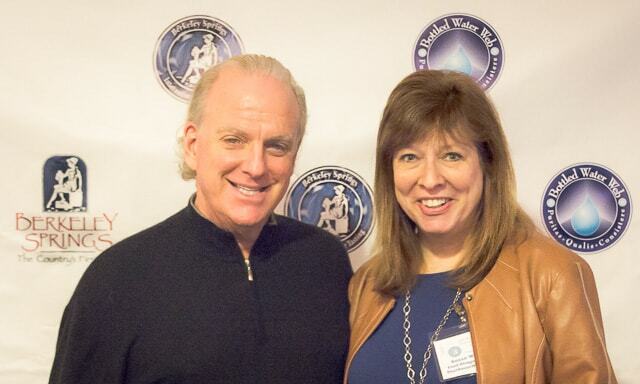 So, what was I doing in Berkeley Springs in the month of February? I’m bona fide! People have been saying I’m certifiable for years, so, there you have it! And not only that, I’m now certified! See? I was trained by the WaterMeister himself, Arthur von Wiesenberger . 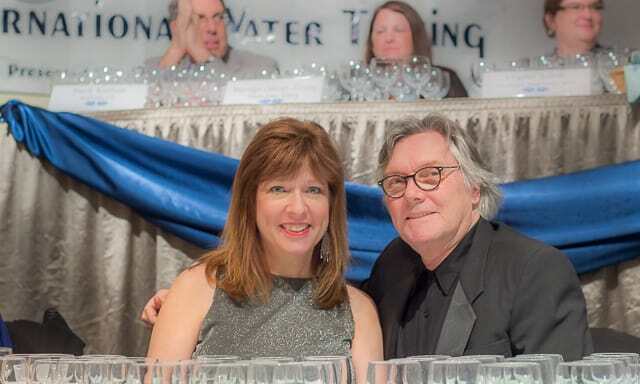 Me, and the Water Meister Himself, Arthur von Wiesenberger. I see a bit of Burt Lancaster in that face. (His, I mean.) How about you? He happens to be the author of the only books out there on Bottled Water! Plus a whole HOST of other qualifications. Just click on his bio! 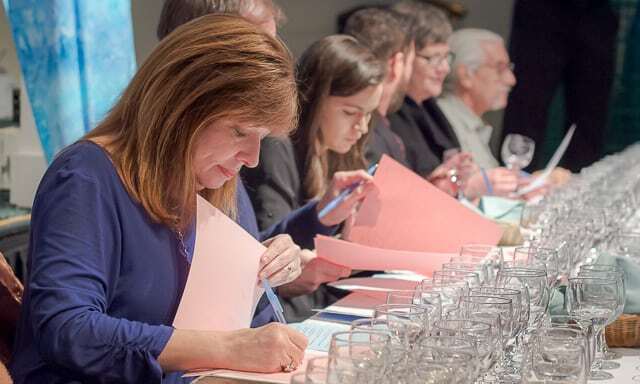 To become certified, we trained in using our senses of sight, smell, and taste to pay attention to the following five aspects of the waters we would be tasting. It’s not rocket science, but it does involve a great deal of focus. I felt like my eyes, nose, and palate were up to the challenge. My fingers (and legs!) stayed crossed that my bladder, too, was ready for the torrent that was headed its way. I gave judging my best shot, y’all! Water, water, everywhere, and many drops to drink!!! 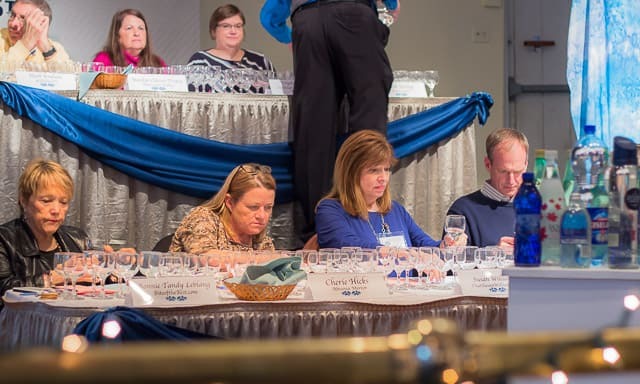 See how focused I am as I fill out my judging sheets? All tastings were done blind – as in, our water servers emptied the bottled water into pitchers that were behind a curtain out of our sight, and then filled the glasses in front of us using those unlabeled pitchers into numbered glasses. So we had no idea what bottled water we were tasting. 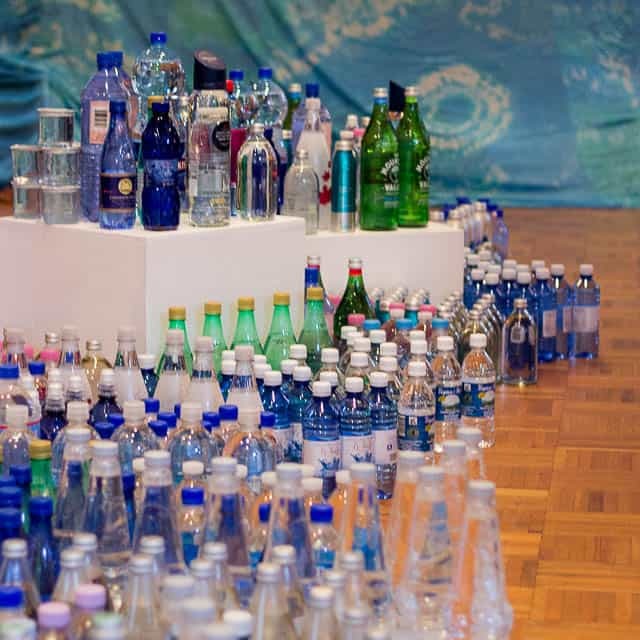 These bottles that were on display, were all snapped up by the audience, as soon as the ceremony was concluded. A veritable stampede occurred during what the event organizers have named the Water Rush. I prefer to think of it as “Greed Goes Wild”. 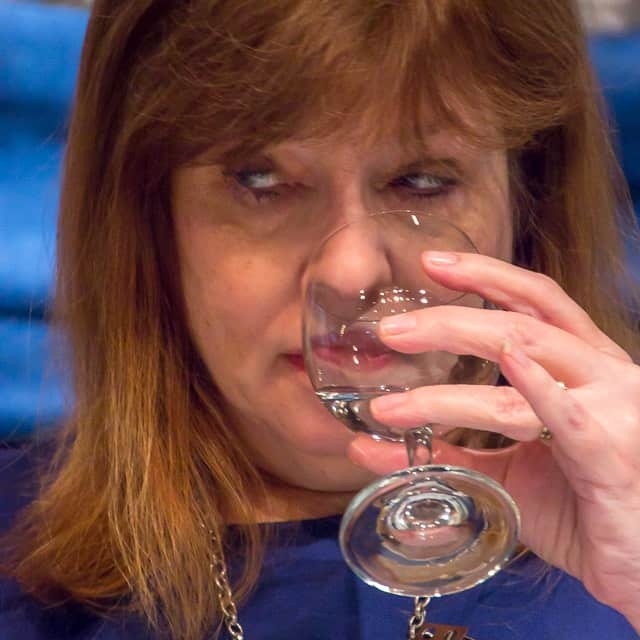 So, here’s a few pics of me, judging water. I realize this will be every bit as stimulating as watching paint dry. Here, you can see me checking out the Number 1 characteristic: appearance. You kind of hope it’s not yellow. Characteristic #2 is Odor. (heh, heh…get it?) Yes, I’m sniffing. Which seems to have brought on a bad case of Stink Eye. We’re going to pretend that in this picture, you’re seeing me do all 3 of the Tasting steps: judging the flavor, mouthfeel, and aftertaste. Hey, I could be. See me rolling it across my tongue, checking for mouth feel and aftertaste? Pretend like you do. There were also two categories in the competition that were judged by the general public, which were dubbed the People’s Choice Awards. They selected the best Package Design, as well as their favorite Flavored Essence Sparkling Water. The man who floats my oh-so-hydrated boat. 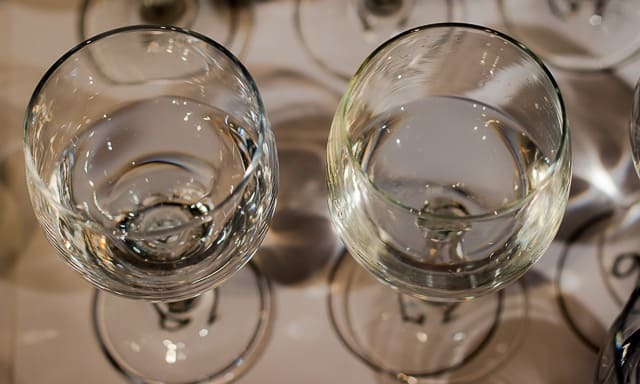 The date has already been set for next year’s 29th Annual International Water Tasting Festival, which will be on Feb. 22-23rd of 2019. I don’t know (because I didn’t ask) if they chose the weekend nearest George Washington’s birthday on purpose, or not, but since they wanted a winter festival for Berkeley Springs, to give tourists one more reason to visit in the winter, it wouldn’t surprise me one bit if that wasn’t purposeful. Stay hydrated, y’all! 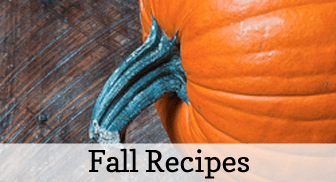 And if you have a Travel board on Pinterest, won’t you consider sharing this pin I’ve made for you there, or share the post on Facebook, Flipboard, or Twitter? Share it with a travel buddy or a water geek you love.